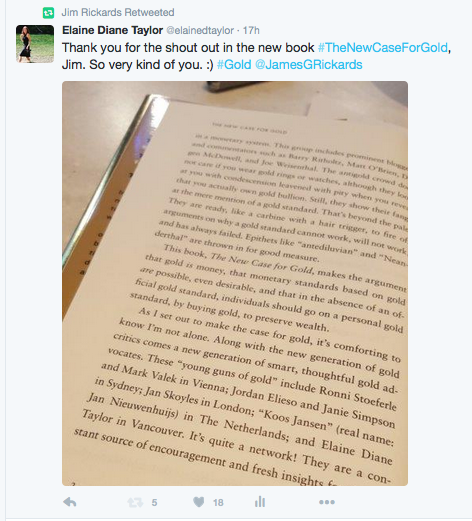 A synopsis of an interview with Jim Rickards, New York Times bestselling author of The New Case for Gold, The Death of Money, Currency Wars and The Road to Ruin, by Daniela Cambone-Taub at Kitco News. In 2013 the Central Bank of Germany notified the US Federal Reserve, the Bank of England and the Bank of France that they wanted some of their gold back. Not all of their gold — just some of it. Germany originally wanted the return done in five years and the US said it would take seven. This could be because some of the gold was leased to other parties and they had to wait for the leases to run out before shipping it back. Germany just finished the repatriation three years early, and had 374 tons of physical gold come back from Paris and 300 tons from New York. They completed their plan three years ahead of schedule and Jim believes it was done for political reasons. Germany doesn’t really want the gold back because there’s no well-developed gold-leasing market in Frankfurt and no experience leasing out gold. Germany wants a floating supply in New York and London to run leasing operations and run the gold price manipulation. Gold sitting in a vault in Frankfurt is price positive for gold. In order to run the price manipulation scheme, where it’s about 100:1 paper gold contracts to physical gold, you have to have some physical gold. That physical gold holding up the paper is called the floating supply. It’s like an inverted pyramid. Physical gold is at the bottom holding up all the paper. Take some of the gold out of the floating supply and it can’t support the paper transactions. Less physical gold in the floating supply makes the pyramid more unstable and the higher likelihood of a price spike. Private vaults in Switzerland have told Jim recently that physical gold is moving from the banks to private storage. Gold in the banks is part of the floating supply. When it goes into places like Brinks it’s not available for leasing. The driving force behind both the announcement of gold coming back to Germany in 2013 and the completion of the gold return ahead of schedule in 2017 is that both years are election years in Germany. Angela Merkel’s position as Chancellor of Germany is up for a vote on Sept. 24, 2017 and she might need a coalition to stay in power. A small nationalist party in Germany really want gold repatriation. Jim believes Merkel stage-managed the gold repatriation with the Deutsche Bundesbank, both the announcement in 2013 and the return three years ahead of schedule this year, in order to keep the nationalist party in the coalition. It was done ahead of schedule because she needs the votes now. Frankfurt now holds just over half of Germany’s 3,378 tons of gold reserves. They also now have 36.6% stored in New York and 12.8% stored in London. Treasury Secretary Steve Mnuchin recently visited Fort Knox to inspect the gold stored there. He’s only the third Treasury Secretary in history to visit Fort Knox, and it was the first official visit from Washington since 1973. The US government does not like to draw attention to gold. Central bankers and governments don’t want people to think of gold as money. So why the impromptu visit? Why now? It may be because the US budget ends on September 30th (which is a Saturday this year so it’s really September 29th), and the Treasury is running out of cash. The Treasury is literally running out of cash and could be broke by then if Congress doesn’t raise the amount they can borrow, called the debt ceiling. But the Treasury has a trick up its sleeve. They could pull $350 billion out of thin air without increasing the debt at all. The gold on the books of the Treasury is booked at $42.22 per ounce. That’s not the price now but that was the price back in 1973 when they first did this. They could mark the gold to market. The Treasury could say that they will now mark the gold at the market price of $1,300 per ounce. So taking advantage of the difference between the price then and now, all the Treasury has to do, according to The Gold Act from 1944, is to send a certificate to the Fed and the Fed has to give them the money. So the Treasury could pull $350 billion out of thin air just by remarking the gold to market. WHAT WOULD THAT DO TO THE GOLD PRICE? At a minimum individuals may start to think that if the Fed is thinking of gold as money then they should start too. The minute you do that you’ll get to $10,000 per ounce gold because that’s what the price of gold would have to be to support the existing money supply. If you had a 40% gold backing for the M1 money supply today then the current price would be $10,000 per ounce. Jim isn’t predicting this will happen. He’s saying that it could happen. The Treasury could have $350 billion without raising the debt ceiling by just marking the gold to the current market price. Maybe Steve Mnuchin wants to do that, and he just wanted to check Fort Knox first to make sure the gold is still there. I’m driving across Canada from west to east solo. Two days ago I had my feet in the Pacific Ocean and today I’m in the Badlands of Alberta. It’s researching and writing time, guitar time and thinking time. Once I set up in Ottawa it will be business time. Then it’s time for the east coast and Nova Scotia. For every time there’s a season, so they say. To write you must fill yourself with the words and music of those you admire. Sir Isaac Newton, Ella Fitzgerald, Rudyard Kipling. And so we mix that with our own experience and analysis, and stand on the shoulders of giants. Gold is $1,317.60 U.S. per ounce today. This pendant has 2 grams of pure nugget and flake gold bullion. Straight from the wild rivers along the Gold Rush Trail in British Columbia, Canada. Unrefined. Encased in boro silicate glass. Hand torched in my studio. Available soon. The news comes down, a little blue bird sings, words of war, of fire and furious things. President Trump has announced to North Korea that it will defend the US and its allies. North Korea has continued to work towards creating the technology to hit the continental US with nuclear weapons. It’s a terrible breeze they speak of. We all know wind can blow both ways. Defense sometimes involves offense. A horrible balancing act that we all wish didn’t need to be performed in a storm.